Every year 250,000 people make the journey to Walsingham, a remote village in Norfolk which since the 11th century has been one of Europe’s great pilgrimage sites. They may not know it, but on the way they pass a new business venture partly inspired by the faith: Archangel Gin, a Norfolk-based drink made with locally grown juniper, and distilled, bottled and labelled in the area. Allingham has many strings to his bow. He is an IT specialist, amateur Egyptologist and farmer. He’s in his early 50s, as is co-founder Jude De Souza, a London-based statistician and former BBC audience researcher. Two years back they joined forces and built their own distillery on Peter’s family farm. The design of the angel on the label is “inspired by the highly stylised angels from the Watts Cemetery Chapel at Compton in Surrey,” Allingham explains. “I’ve had those images in my head since I first saw them about 30 years ago.” The seal on the bottle-cap foil reads Angeli ab oriente: “The distillery is in the heart of the diocese of East Anglia and I like to think of our products as Angels from the East,” he says. I have always wanted to go to Walsingham. Now, more than ever. I love the entrepreneurial spirit. This entry was posted in ¡Hagan lío!, Just Too Cool, Lighter fare and tagged gin, O.L. of Walsingham. Bookmark the permalink. The name “Allingham” and the area of East Anglia bring to mind the great mystery writer, Margery Allingham. I wonder if this gentleman is related? Anyway, a well-made local gin is a very nice thing, and it sounds like they have some good ideas to make it stand out. Argh. Make that “Norfolk.” Argh. “Archangel is certainly a rich, heavy and complex gin. On the face of it, the list of botanicals is daunting – juniper, verbena, orange peel, cinnamon, cloves, ginger, sea buckthorn, and cardamom. You can’t help but wonder how they’ll work together? Surely the flavours are too powerful and will fight with one another? Allingham even professes that they were “deeply apprehensive and thought we’d have to start all over again” when they tasted it straight from the still. Well, far from it. After allowing the distilled product to settle and infuse for five weeks, the result is gin perfection. The botanicals work in perfect harmony and, while full-bodied, the gin isn’t overpowering; in fact it has a beautifully smooth finish. It is a gin of real craft, refinement and, best of all, has none of the harshness that many have on the finish. Of course, none of this matters if it doesn’t make a great G&T and, unsurprisingly, they had great fun trying to find the perfect mix. What they ended up with was a surprise to all – Fever Tree with orange peel to garnish. Worried that Fever Tree might be too powerful for the gin, it was a late entry to the tonics tested, and orange peel rounds off each of the botanicals beautifully, as I discovered at a private tasting with Allingham last weekend. We even set about trying to find the perfect recipe for an Archangel Martini and found, quite contrary to logic, that the Bramley & Gage dry vermouth was the perfect vermouth for it. This vermouth is infused with numerous botanicals, including wormwood that, on the face of it, would seem too much to pile onto the botanicals of a gin, especially the floral, spicy and complex botanicals in Archangel. Again accompanied with a twist of orange, it makes for a stunning cocktail; the botanicals all play together rather than overpowering one another. Sancta Seryn eos protegat (et inspiret). There’s no problem, Suburbanbanshee! East Anglia as a geographical term includes Norfolk. And Cambridgeshire, including the wonderful Cathedral of Ely. Well worth seeing, and Peterborough too. And what an educated gentleman Mr. Allingham is, I must say. In the best English tradition. O thanks for the Gold Star! I remember playing that song on my recorder in my teens. It’s very catchy. Daniel Matsui puts so many fun and interesting items in his artwork. Is that a frog at Our Lady’s feet? I’ve learned to scour them to see what he’s hidden. Lovely. For the sluggish days of late January, this gin post and comments are a sure tonic. 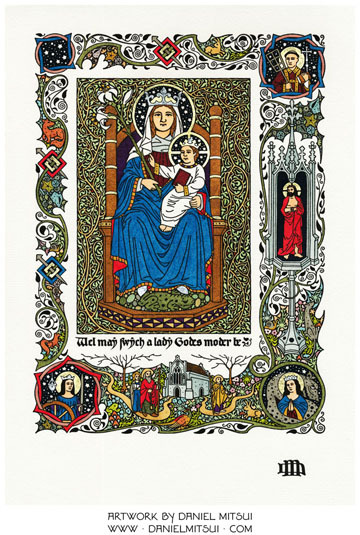 Kathleen10 – Our Lady’s feet are resting on a “toadstone”. In the Middle Ages, toadstones represented evil.